Dates of birth and death unknown. Younger brother of Namie Karumo and son-in-law of Yamanaka Heikurô I's aunt, his first stage name was Nakamura Kuheiji but his relationship to the Nakamura clan could not be clarified. Thanks to his family relationship, he became a disciple of Yamanaka Heikurô I and received the name of Yamanaka Heijûrô I in the 11th lunar month of 1709 at the Ichimuraza, where he performed as a tachiyaku in the kaomise drama "Genpuku Nue Yorimasa". He became katakiyaku in the 1st lunar month of 1713, performing at the Ichimuraza in the new year drama "Taihei Onna Imagawa". He went to Kamigata in Fall 1713 and performed in Ôsaka in the kaomise drama "Yoyo Meoto Tsuru no Mago", which was produced by Arashi Sanjûrô I. He became jitsuaku in the 11th lunar month of 1735 in Kyôto at Kameya Kumenojô's theater, where he performed in the kaomise drama "Ôkamado Miyako no Ichigura" which was produced by Yamamoto Kyôzô. He appeared on stage for the last time in the 11th lunar month of 1748, in Kyôto Miyako Handayû's theater, where he played the role of Ômori Hikoshichi in the kaomise drama "Mitsu Uroko Asahi no Ume", which was produced by the zamoto Somematsu Shichisaburô I. He most likely died in 1749. There will be in the future to come a full page dedicated to Yamanaka Heijûrô I in kabuki21.com. Born in 1732. Disciple of Kasaya Matakurô I, he received the name of Kasaya Matagorô and started his career in Kyôto in the 11th lunar month of 1756. 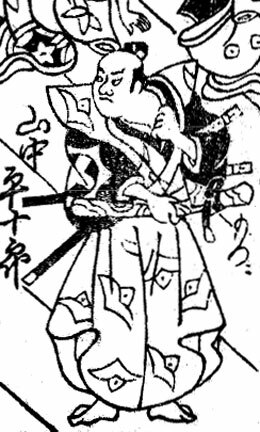 He took the name of Yamanaka Heijûrô II in the 11th lunar month of 1759 in Kyôto at the Minamigawa no Shibai, performing as a katakiyaku in the kaomise drama "Hônen no Miyako Mutsuki no Kotobuki", which was produced by Sawamura Kunitarô I and celebrated the shûmei of Nakamura Kichiemon I, Nakamura Jûzô II and Matsuya Shinjûrô. He appeared on stage for the last time in the 2nd month of 1768, in Kyôto at the Minamigawa no Shibai, where he played the roles of Kishida Ikkaku, Katô Toranosuke and the yakko Totahei in the new year drama "Keisei Momoyama Nishiki". 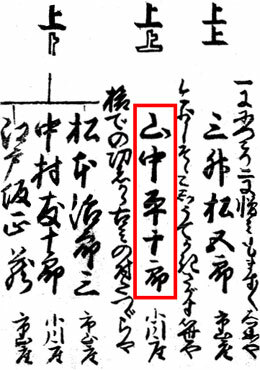 His last ranking, in the 1768 Ôsaka hyôbanki, was jô-jô-(shiro)kichi (superior - superior - (white) excellent). He died the 10th day of the 11th lunar month of 1769. There will be in the future to come a full page dedicated to Yamanaka Heijûrô II in kabuki21.com. Dates of birth and death unknown. Disciple of Fujioka Daikichi, his first stage name was Fujioka Monzô. He took the name of Yamanaka Heijûrô III in the 11th lunar month of 1772 and was active up to 1778. He was a minor katakiyaku. His last ranking, in the 1778 Ôsaka hyôbanki, was jô-(shiro)jô (superior - (white) superior). His haimyô was Ikki. There are huge differences between the latest edition (2012) of "Kabuki Haiyû Meiseki Benran" and Nojima Jusaburô's book "Kabuki Jinmei Jiten"; in the latter, Yamanaka Heijûrô I was active up to 1715 and never held the name of Nakamura Kuheiji. We've decided to stay in line with the "Kabuki Haiyû Meiseki Benran". 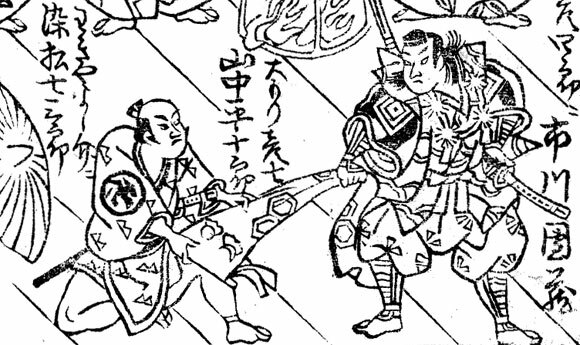 There are huge differences between the latest edition (2012) of "Kabuki Haiyû Meiseki Benran" and Nojima Jusaburô's book "Kabuki Jinmei Jiten"; in the latter, Yamanaka Heijûrô II held the name of Nakamura Kuheiji around 1734 in Nagoya and took the name of Yamanaka Heijûrô II in the 11th lunar month of 1735 in Kyôto. We've decided to stay in line with the "Kabuki Haiyû Meiseki Benran". There are huge differences between the latest edition (2012) of "Kabuki Haiyû Meiseki Benran" and Nojima Jusaburô's book "Kabuki Jinmei Jiten"; in the latter, Yamanaka Heijûrô III was described just like Yamanaka Heijûrô II in the former. We've decided to stay in line with the "Kabuki Haiyû Meiseki Benran".